Shakespeare's Lear starts off at the edge of a cliff and jumps. That's essentially the plot of the play. If Lear had his marbles, he never would have made his outrageous demand. Perhaps his disinhibition is the first stage of senile dementia. Things never improve which is. in effect. the nature of matter. Once man is born his death begins. Something comes out of nothing and nothing comes out of something. 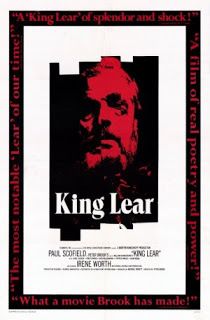 Lear: "Nothing will come of nothing" (I,ii), Gloucester: "The quality of nothing hath not such need to hide itself" (I,ii), Lear: "Nothing can be made out of nothing" (I,iv), Edgar: "Edgar I nothing am" (II,iii). Nothingness is the common denominator, oblivion the cosmic constant. Lear, Gloucester and Cordelia are all swept up, but they are only the first to go. The universe is pagan and curiously modern, striped as it is of the cushion of belief. The play is less about theology than ontology. Nature and the cosmos are the subject and the pain of the playwright's vision lies in its implacable and unbending materialism. The true tragedy is that of consciousness. Were they just slugs on a wall, neither Lear nor Gloucester (whose willfulness is a mirror of Lear's) would have had to endure the painful awareness of their own dissolution.